Adblock, System-Wide, without Plugins… Pi-Hole! This is absolutely awesome. I just came across Pi-Hole, a DNS based ad blocker that you can install on a Raspi or just some Linux box you may have around. A much more detailed instruction, with lots of screen shots, is here. Some packages are going to be installed, and later you just point your device’s DNS server to be the IP address of that Raspi or Linux box where you installed Pi-Hole. Since I have a router with OpenWRT, I have dnsmasq on it and hence have modified its dnsmasq.conf to have its server= statement point to the IP of the Pi-Hole box. What then happens is that every DNS request will be routed through the Pi-Hole box, and if it is from a known advertiser, it will just be blocked. The net effect is, that all your devices will be mostly completely ad free. Since the only traffic going through that box is DNS requests, the solution is very fast, compared to web proxies. As you can see, the vast majority of my requests come from 192.168.1.1, which is my OpenWRT router that is now redirecting the DNS requests it gets – which means mostly all – through the Pi-Hole box. For more technically inclined, here is the forum where Pi-Hole users discuss. Here is a blog post of some other user who has posted some more details on the topic. #!/usr/bin/python # -*- coding: utf-8 -*- # Pi-hole status # v1.0 # Siim Ots # siimots # Show your Pi-Hole (Raspberry Pi adblocker) status. 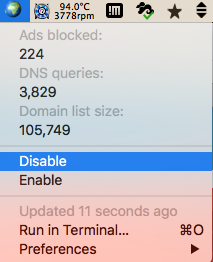 Todays blocked ads, DNS queries and number of domains in block list. # http://gis.ee/files/pihole-bitbar.png # pi-hole,python import urllib2 import json # If you have UTF-8 problems then uncomment next 3 lines #import sys #reload(sys) #sys.setdefaultencoding("utf-8") # Change to Your Pi-Hole Admin Console URL pihole = "http://pi.hole/admin/" try: url = pihole + "api.php" result = urllib2.urlopen(url, timeout = 5).read() json = json.loads(result) print "🌍" print "---" print "Ads blocked:" print json['ads_blocked_today'] + "| href=" + pihole print "DNS queries:" print json['dns_queries_today'] + "| href=" + pihole print "Domain list size:" print json['domains_being_blocked'] + "| href=" + pihole print "---" print "Disable | href=" + pihole + "?disable" print "Enable | href=" + pihole + "?enable" print "---" except: print "❌" print "---" print "Pi-Hole not found | color=red" print "---"
# Show your Pi-Hole (Raspberry Pi adblocker) status. 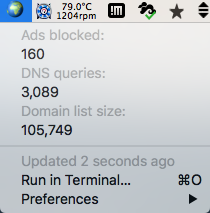 Todays blocked ads, DNS queries and number of domains in block list. url = pihole + "api.php"
print "Disable | href=" + pihole + "?disable"
print "Enable | href=" + pihole + "?enable"
print "Pi-Hole not found | color=red"
And, as an uber-cool hack, should you use (unlike me) an actual raspi for this, here is how you can activate/deactivate Pi-Hole with an actual hardware button.